The "Reproductive Rights Advocacy Fellowship" was a one-year medical fellowship that would have hired a doctor to "spend one year as a 'trainer in training," Campus Reform reports, learning to commit abortion and abortion-related procedures, such as "vacuum aspiration of the uterus." "We have pulled the position from the web site and are no longer hiring for this role," UM Medical School Dean Jakub Tolar said via a statement. "We will examine the value of this training in the context of our mission along with the values of the community." After the doctor had learned to perform abortions, he or she would have been sent to "teach these procedures to others," the job description said, including "spending at least 20 days at a high-volume abortion site, getting training and becoming a trainer." "Abortion training at Planned Parenthood MN, ND, SD in St. Paul, MN," was in the first part of the curriculum, and so was training for "family planning," "reproductive health," and "reproductive advocacy." Creating a pro and con chart on having an abortion and managing patients' spiritual or moral concerns were part of the proposed counseling techniques the doctor would learn in the fellowship. A workbook for the doctor describes abortion as a "safe" procedure and one of the "most common outpatient procedures performed among women" in the United States. It went so far as to suggest that medical abortion may be better than carrying a child to term, stating, "The [maternal] mortality associated with childbirth is 14 times that of legal abortion." After Campus Reform reported on the fellowship, some students from various UMN campuses spoke up, saying it was "unthinkable" and "disgusting." "It is frightening that a publicly funded university is actively promoting and supporting abortion here on campus," Nick Johnson, the president of Students for Life at UMN, Twin Cities said. "The university has a job to uphold a high moral standard being educators," said Johnson, "and they are clearly violating these principles by further engaging in abortion promotion." UMN-Duluth's pro-life club Bulldog Students for Life said, "Abortion should be unthinkable, and to see the University of Minnesota embrace the pro-abortion throwaway culture raises many questions." "What are the University's motives in supporting this industry?" asked that group's president, Noah Maldonado. 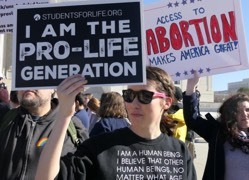 "If they are caving to the abortion lobby now, what else is in store?" "We don't know at this point," he added, "but what we do know is our tuition dollars are supporting an institution that does not only disregard the fundamental dignity of every human life but is Hell-bent on destroying it." "Doctors are hired to save lives, not terminate them," said Alex Grubish, another UMN-Duluth student.